The operators of Sinbad’s Restaurant have lost their lawsuit intended to extend their four decade stay on Pier 2, a move which they’ve known about for years and a site which they were supposed to vacate in March. An appeal could extend Sinbad’s stay for a couple more months, but otherwise it’s case, restaurant and bar closed in order to make way for the Port of San Francisco’s Ferry Terminal Expansion project which includes the removal of Pier 2 to accommodate the construction of two new berthing facilities and covered passenger queuing areas. The Port’s South Basin project is slated to commence this coming spring and will infill the adjacent lagoon to create a new Embarcadero Plaza between the Ferry and Agriculture Buildings as well. San Francisco’s ferry terminal will serve a projected 32,000 riders per weekday by 2035, including new service to Treasure Island, up from around 10,000 passengers today. Great. Need more ferry use generally. Improved access to improving north bay locations. And still no plans for a water taxi stop here for transfers? Trying to understand why not. Water taxi stops at Pier 1 1/2, all of 150′ north of Gate A. Totally doable as a transfer. Thanks @j_blu. I know its a nit, but it would be nice to have a transfer at the Ferry Building. I think it would be just a little more visible as an option to commuters. Totally agree – the building at the end is not good for the ferry plaza. Would be nice to see a re-design of it – even with a new smaller building to the side or something. Could be amazing. Enclosing the upper level of the golden gate terminal could be interesting too. The Agriculture Building is an historic landmark. Either move it or tear it down to open up that magnificent view of YBI/BB at the foot of Mission Street. Other than being old, it really has no intrinsic historic, and certainly no architectural, value worth preserving in situ. Ah, damn. The food wasn’t great, but I really loved the view from the bar. This was always a stop off on my way to a Giants game. Not with that kitschy 70’s vibe it won’t. Like the Hi-Dive. Or Red’s Java House. Or Pier 23. Or Java House. Or Pier 40. It is so comforting that people will still have something to complain about. Relax. Yes, there are other places. I’m fond of the bar at Sinbad’s and expressed my feelings as such. There’s no reason to turn it into WWIII. Good riddance – Sinbads is an anachronism. As a daily ferry rider, also happy to see capacity and queuing improve, as the lines run all the way down Embarcadero often. Seriously. So hard to find a good restaurant nearby. Epic Roasthouse and Waterbar are great. Sinbad’s is old-school waterfront and I’ll miss it. 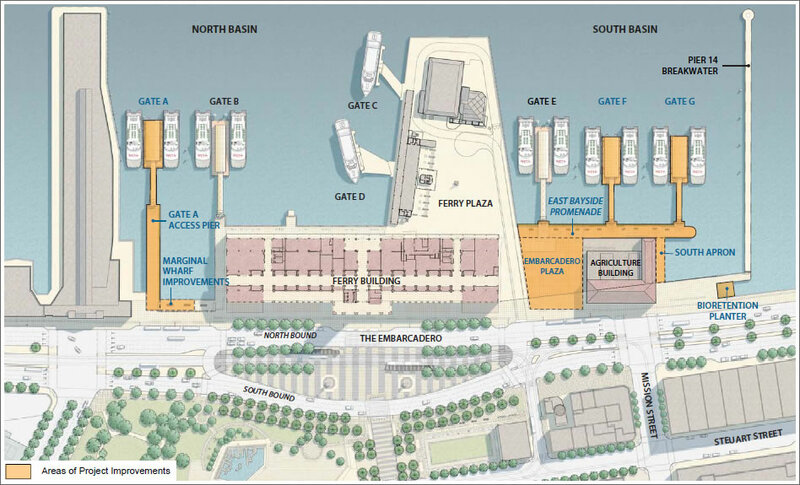 I know it’s a done deal and they don’t have a leg to stand on, but looking at these plans, couldn’t new berths could have easily slotted in between gates B and D, and at the end of the Ferry Plaza? Then I could have continued my late night negronis with the best dive bar view on the west coast. Maybe there’s room for another dock there, the little bump might indicated it. Mostly it’s due to the poorly designed Ferry Plaza (parking lot), which used to have like 10 landings and now only has 2. So now most of the boats have to land on the auxiliary docks. What’s the story with the GIANT hulking derelict restaurant East of the Ferry plaza? It’s a 70’s space wasting eyesore. I really, really hope that they get rid of that monstrosity. It epitomizes ugly 70s architecture and has no place there. please god no more shipping containers. 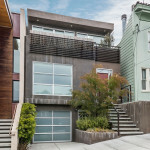 so tired of shipping containers – they’re like First World favela shacks. Exactly. Every time I see one of those that contain a shop, or worse, a food vendor, all I can think of is eating out of a dumpster. They just contribute to the dumbing down, the classing down of San Francisco. Something I can agree with Futurist on. Trash cans with plants growing out of them are somehow the greatest invention in SF in the 21st century. Well, the entire city’s a trash can, so maybe it’s a form of interpretive art. Since those are temporarily, unlike what is there now, it would likely be a better use of that space. A… Wall on the Waterfront? Much of the bulk of that structure is BART tunnel related ventilation- not going anywhere. Ah yes, completely forgot about that. Remember seeing the huge vent grates and hearing the machinery. It can however be made more attractive from the outside if that restaurant were razed and something nicer built. 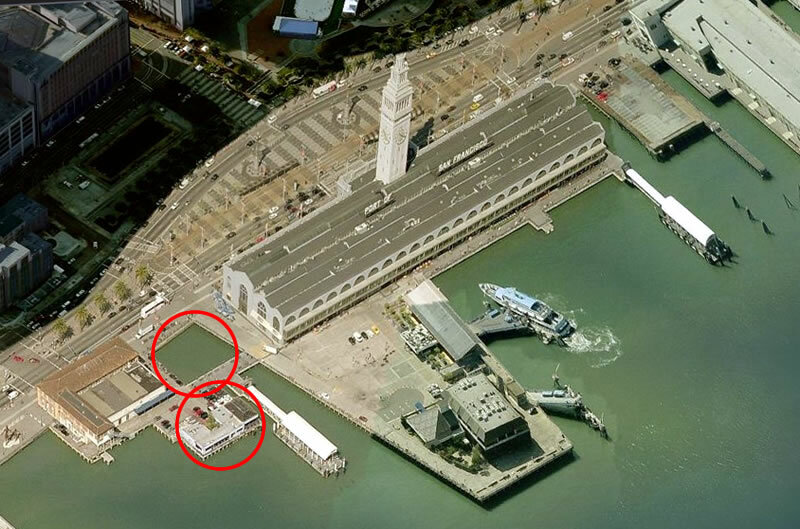 Part of the problem is the Golden Gate Transit ferry terminal – by blocking the view of (and straight access to) One Ferry Plaza, it really detracts from the building’s potential. If the GG Transit structure weren’t there, there could actually be an interesting dynamic or interplay between the bustling outside world of The Embarcadero, then the interior of the Ferry Building – then walk thru that and there’s a nicely laid out plaza (instead of a concrete faux parking lot), with yet another destination structure beyond. The filled in area called Embarcadero Plaza is welcome to expand the area available for the Farmer’s Market. Perhaps more seating and restrooms can be built there.